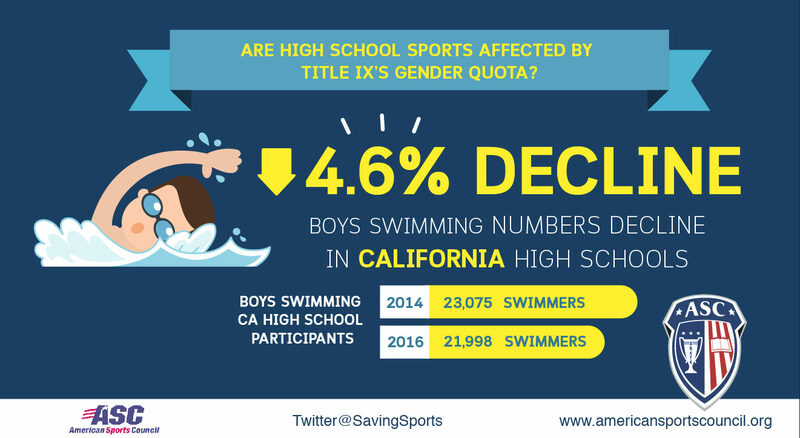 Recent data trends show that Title IX’s gender quota may now be harming high school athletics by restricting boys’ participation in sports. See SavingSports blog post, Appeals Court Ruling Paves Way for Gender Quotas in High School Sports. We have been watching high school athletics participation rates closely, especially in the state of California where the Ollier v. Sweetwater case will strongly influence public school administrators. Two year trends for boys’ H.S. sports participation are alarming. Multiple boys’ sports are showing declines. Sports fans who enjoy watching U.S. athletes compete so successfully at the Olympics every four years may be shocked to learn that participation numbers for high school boys’ swimming are not rising. With such a high media profile at every Olympics, one would think that men’s swimming would be thriving. Not so, and supporters of boys’ swimming should be alarmed. In California, a key state for the sport of swimming, according to the National Federation of High School Association’s data, total participation in boys’ swimming has declined by 4.6% in the last two years! Give Credit to Athletes for Winning Olympic Medals- not to Title IX. No Replies to "Trend Watching- Title IX & H.S. Sports"